Asked to design a prone stander that will "stand up" to the rigors of the institutional environment while having qualities that would also encourage home use, we came up with the Biostander. The steel base offers a weight distribution that allows for a low center of gravity. 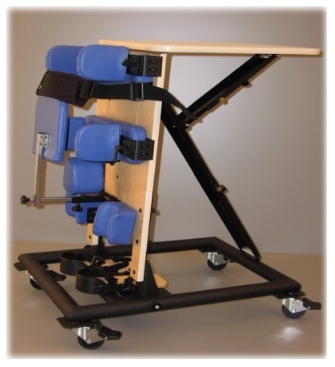 This creates a stable stander with a small footprint. Using heavy duty industrial casters with rubber wheels, the stander rolls easily while making no noise. Prone angle adjustability is infinite through a steel slide mechanism. Positioning accessories include lateral hip and trunk pads, knee blocks, foot positioners and a "tush push". Within each size is enough adjustability to allow for home use for a single user or in a clinic setting with multiple users. If the stander will be used in a home setting, it folds up in seconds allowing for easy storage.